Nine hours of math camp has since been added to the SSSDSS Facebook Page. The picture is Top View. The child has built 11 to 18. The Mortensen Method is concept-based teaching. Jerry Mortensen was Montessori trained, so of course his methodology is based on Montessori principles and teaching. You'll see PDFs and videos that help you get the concept across to your students or children. 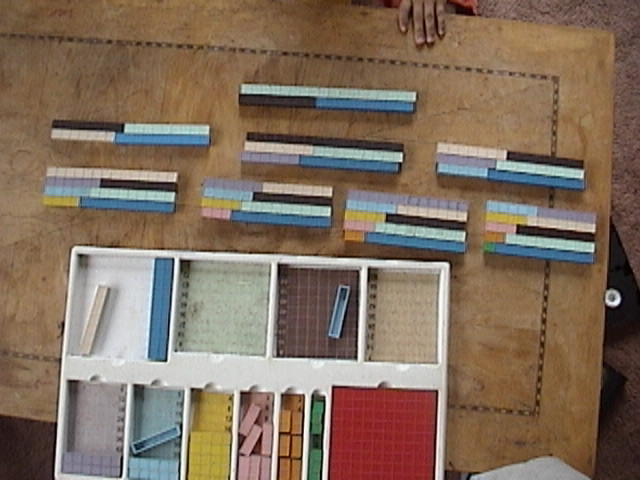 Using concepts makes math fun and easy because once the child understands concepts all we can do is change the numbers. The concept shown above for example is a simple concept but numbers are made up of other numbers, The child is building Addends past 10. The lesson about the pyramid that contains Concrete Drawing and Symbol, isn't on the concepts page yet. It is on one of the videos in module to teacher training. There are other Videos and PDFs to help explain the topics below. There are also links to pages of for further explanation. The first thing you'll see when you click enter, is a box for you your password. Use the module three password. This entire website can be boiled down to these five concepts, & variations around these five themes. 2. The concept of SAME. The highest number we can count to (in base ten) is 9, the numbers tell you how many the places tell you what kind. Before we can count they must be SAME. 3. We form rectangles to facilitate counting. No Fun Get Back To One. NFGBTO. Remove the "NO" from the lesson. Place the student in a situation where they can not fail. Early Exposure to Math Concepts Helps Ensure Success. And here is the most basic concept of all, keep it fun (as much as possible) and play math. Especially when they're little.